Have you ever wanted to find out what WordPress theme/plugins a site is using? Lets face it when we see a great design that we like we want it. But how do you find out what theme and plugins they are using? Is it a WordPress website? Webmasters will probably view the source code, and might find it. About 7% of all websites on the web are built with WordPress software so you have a 7% chance that the site is made using WordPress. As you browse on the web you come across one of the best WordPress themes that you have seen. You think it could be WordPress and would like to find out more about the theme. Is it a free theme? If its a theme you have to buy how much would it cost? 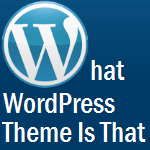 All you want to know is what WordPress theme is that. If this has happened to you then bookmark this page. This post is for you. If you view the source code you might find what the name of the theme is. But not everyone knows how to do this or where to look. There is a much easier way to find what theme the website is using. There are two websites that you can use to find out what WordPress theme a website is using. They will also show you what plugins the site has as well. What WordPress Theme Is That is a free online tool that lets you know what WordPress Theme a website is using. It shows you the Theme Name, Theme Homepage Link, Version, Description, Author of the Theme, Parent and Child Themes. It also detects some plugins that are being used in the site. WordPress Theme Detector is another way that you can find out what WordPress theme a site is using. It will also detect the plugins on the site and list them. Another important thing is that it lets you know the discount campaign for a Premium WordPress Theme when its available. Why use Word-Press to build your site or blog? Building a website with website building software called WordPress would be a great way to get your business online. Choose your site design from thousands of free and payed WordPress themes, get extra features using free plugins. Build your site in 3 EASY STEPS. STEP 1. Choose your Domain. STEP 2. Sign up for Hosting. STEP 3. Build your site with WordPress.